Today, Carl Jung's psychological models are pretty much ignored by modern academic psychologists. (Freud at least gets an honorable mention, if only in derision!) Perhaps the only place where Jung has continued to play an integral role is via the ubiquitous Myers-Briggs Type Indicator. It's a shame, because, while Jung's nacsent models seem outdated in light of modern studies, they're very valuable when describing the nascent psychology of Internet communications. 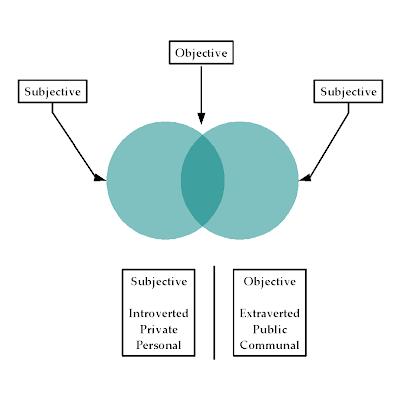 Jung's first psychological model is the most valuable, that of the dichotomy between subjective and objective. Today, the connotations of subjective and objective are very different from Jung's original denotations. In order to properly apply his model to Internet communications, some clarification is necessary. Objective systems of psychological understanding. An objective system is made up of that information which is commonly understood for anyone who is in the same context. That is, it provides a collective way to understand the various aspects of any circumstance. They provide 'rules of thumb' or commonly understood ways of communicating basic needs and ideas. They tend to be concerned with surface, easily seen attributes and behaviors. The limitations of such systems are that they tend to override adapting to any particular situation on its own terms but rather encourage one to apply a preset response. They also tend to *suppress* subjective personal expression and understanding. Subjective systems of psychological understanding. Whereas objective systems revolve around common ways of communicating and interpreting events, subjective systems revolve around personal experience. In other words, they arise from the unique circumstances and experiences of the lone individual. Have a 'you had to be there' sort of quality. Have the virtue of arising from first hand, practical experience. Represent how the lone individual understands and conceptualizes his environment. The main drawback to subjective systems is that they are too idiosyncratic to be easily understood by others. The sort that can only be understood in an individual way - but it is hard to translate that into a collective system of action or belief. Jungian thought is primarily concerned with the subjective comprehension of the individual - e.g. how they conceptualize their world. It is not primarily interested in group to group relationships or providing an objective system for interpersonal interaction. Despite the last caveat, let's apply these descriptions to Internet communications anyway. To date, multi-user spaces have attempted to create the absolutely objective POV. The subjective POV has been completely ignored, or actively suppressed. There are a priori limitations to attaining objective communication in realspace, and there are also a priori limitations to internet communications. Therefore, simultaneity can only exist as an abstract ideal. This isn't to say that we should stop striving to close the gaps to achieve a synchronous nirvana, but we're doing at the expense and suppression of the individual end-user. In the battle between objective and subjective, when we're talking about Internet or Realtime Communications, the subjective wins by default. Technologically, after all, my computer's specs are different than yours. Additionally, my internet connection speed is different from yours (as well as how I connect). So is my monitor measurements, screen size, and resolution. Psychologically, my perception of information is probably different than yours. How I evaluate said information is probably different from yours as well. Additionally, my color perception, vision acuity and hearing are probably different too. Jung originally saw objectivity and subjectivity as a dichotomy, an abstract and strict either/or : either it's a global view or an individual view. The power of imagination is that we can navigate the full spectrum of a bi-polar model, describing shades of gray between black and white. The power of computer technology is that we can illustrate those descriptions and share them with others. "Look, this is how I see this." With technological and psychological differences amongst every end user, we should take advantage of those differences and embrace the subjective just as much as we strive to create sameness and achieve absolute objectivity, and help people communicate, and understand, both.